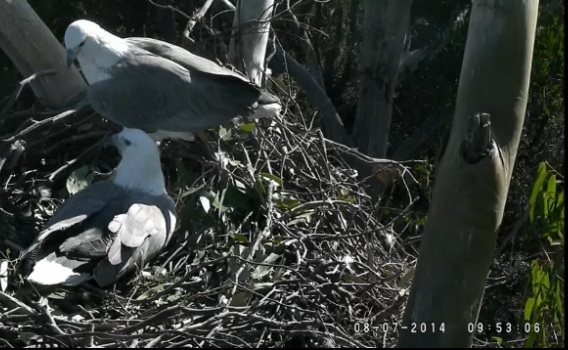 Home › Places & green spaces › Sea-Eagles lay two eggs! 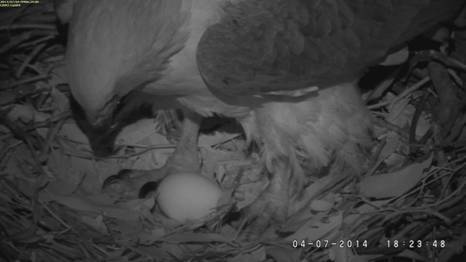 Sydney Olympic Park’s resident White-bellied Sea-Eagles have laid their first egg for 2014, on Friday 4 July at 5.28pm and their second overnight! The pair has been nesting in Newington Nature Reserve, Sydney Olympic Park since 2008, which has led to the successful fledging of seven chicks. In 2009, an EagleCAM was mounted nearby and since then the EagleCAM team has observed the behaviour of the eagles from nest construction to the fledging and dispersal of chicks. EagleCAM provides a 24-hour live stream of the nest to a worldwide audience of keen birders to see how the pair is going. We will keep you updated on how this breeding season progresses!